Which means the state would really like all sixth graders to read this book. I suppose some state folks might argue differently about my view on that — that this book is merely one example, and all that, but who’s kidding who? They don’t spent a year or more working on a model unit just for the fun of it. Me? I had trouble getting through the book. Again, it’s not the story (although how much killing and battle can one read about before getting glazed eyes). It is the writing in this book. At least, that’s my humble opinion. Sutcliff’s text would go right over the heads of most of my sixth graders, and I can tell you quite honestly that I would probably lose them in the first chapter. With numerous characters and countless Gods, and with the story shifting between the heroes of Greece and the heroes of Troy, I could barely keep track of who is who, and I know the story already pretty well. 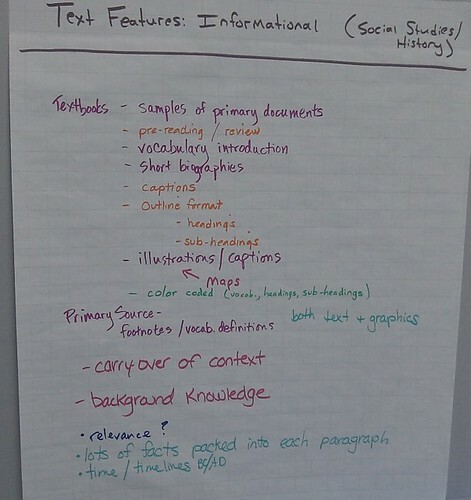 No doubt, the inclusion of this text is a sign of the “complex texts” element of the Common Core, and the drawing of connections between literacy and Social Studies. I get it. But I wonder if the folks who worked on this unit, and the folks at the Department of Education, thought deeply enough about something more than reading when choosing books (although, a quick look at the Lexile site shows that Black Ships, with a level of 1300, is clearly a high school text Or am I reading that wrong?). If we lose our students in a book early, it is painfully difficult to get them back. I know this from experience. 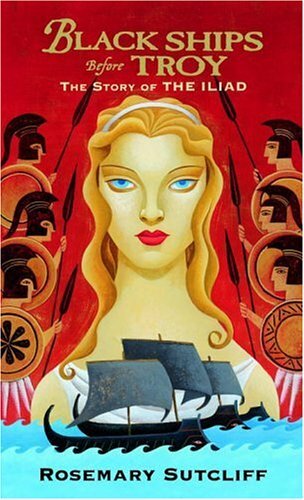 And it’s not just Black Ships Before Troy, either. I notice that Tuck Everlasting, which is a beautifully-written novel with some huge themes, has been set up as a text for fourth grade. Fourth grade? I teach this book in sixth grade, and there are many students who struggle with the issues raised in the novel, as well as the way that Natalie Babbitt uses her poetic skills to tell her story and set the scene. It’s a perfect text for 12 year olds. But 9 year olds? I don’t think so. (although Lexile does think so, as its 770 designation puts it in the fourth grade category). There’s an issue of the Common Core. And there’s the issue of Common Sense. In this case, the two ideas are not meshing. And that is frustrating to me, as the teacher who wants to instill a love of reading and books in my students. I grabbed this from blogger Andrew Wales, who does a wonderful job with creating graphic stories and panels that captures his views of the world (mostly art, but also, teaching). This one is about reading, and comes from his notes after reading a book about the teaching of reading. 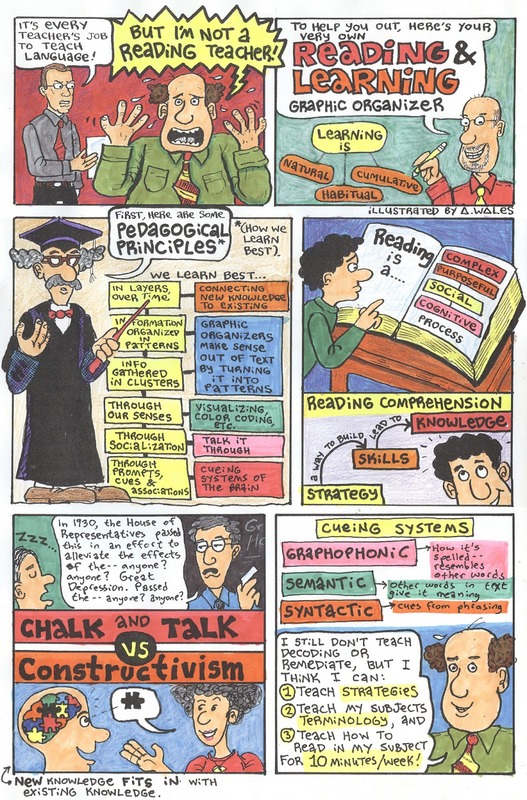 It connects nicely with Common Core’s push that everyone is a teacher of literacy. If ever there was a good use of Dan’s Awesome Rage Maker comic site, this is it. 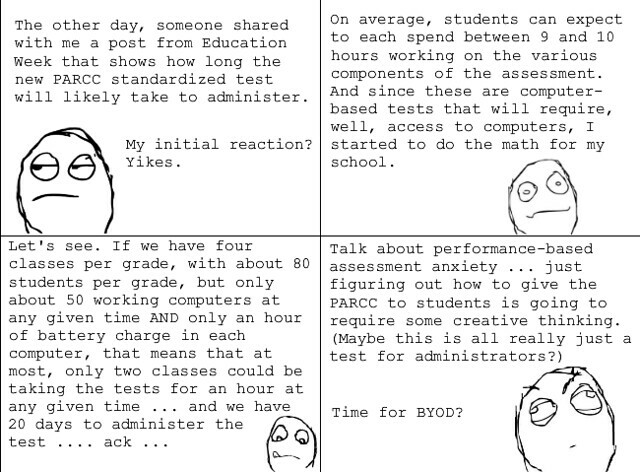 I discovered some news about the length of time it will take for students to complete the components in the PARCC assessment. That led to me thinking of my own school. Which led me to shaking my head. 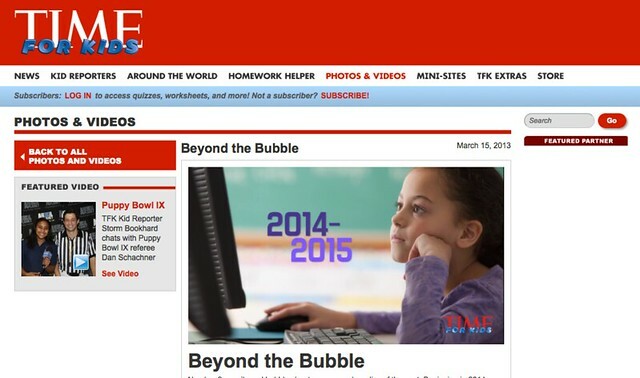 PS — here is a link to the EdWeek article. How timely is this? The cover story to Time for Kids magazine this week is all about the shifts coming around Common Core testing (either PARCC or Smarter Balance.) We have our own Massachusetts state reading assessments next week (with Math in May). So, testing is on our minds, as much as I would not like it to be. I’ve talked to my students about the changes in our state’s expectations (ie, Common Core) and the changes that are coming down the pike with testing. 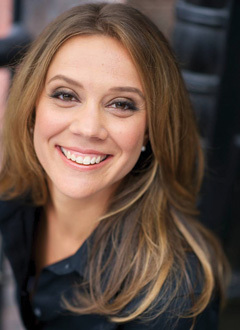 The TFK cover story, however, provided a solid overview of what they can expect to see happening in the next two to three years. Will students HAVE to use the computer or will they have a choice to use paper? What if a school doesn’t have enough technology? How will students take the test? How long will this test take to do? What if you don’t have good typing skills? Could someone cheat by using the computer to find information online? For the tests that are “computer adaptive,” does that mean that students who answer incorrectly will have more questions to answer than those who answer correctly? 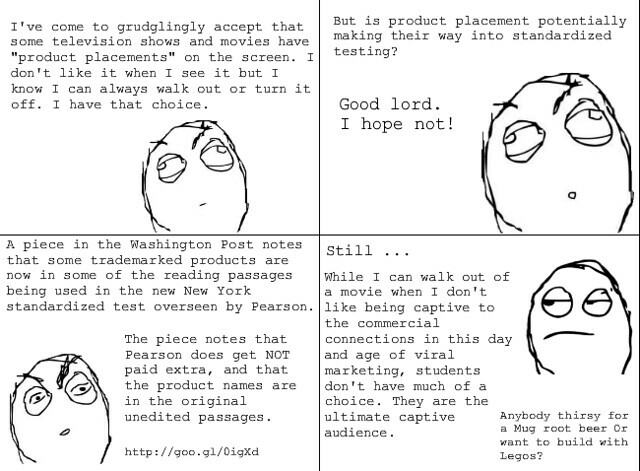 (Computer adaptive tests move the student forward in different directions, depending on the previous answer). Why is there more writing? My mom/dad says this new test is coming because too many teachers are teaching to the (current test). Is that true? I didn’t have the answers to all these queries, because so much of what is going to happen remains unclear and muddled. As for that last question (which was asked by three different students in three different classrooms, by the way), I tried to explain that while that may be happening in some classrooms in some schools, and it may be a worthy complaint, I did not feel that we were doing that. 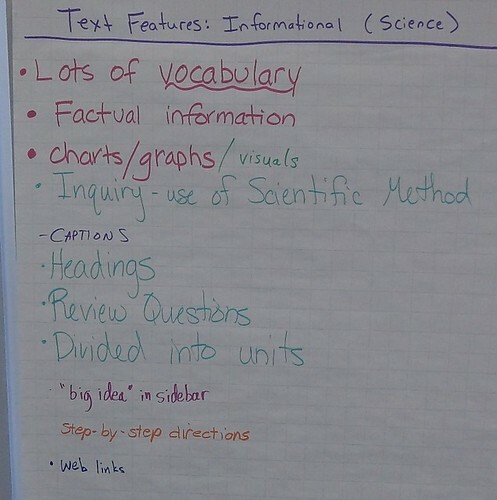 However, I acknowledged that the kinds of teaching we are doing now, and the levels and kinds of expectations that we have for students now, has changed over the past three years (more evidence-based writing; more research activities; more non-fiction, argumentative, expository pieces) due to the shifts. And then we started to talk about strategies for next week’s state reading test. So maybe the complaint about time spent teaching to the test is valid, after all. Sigh. 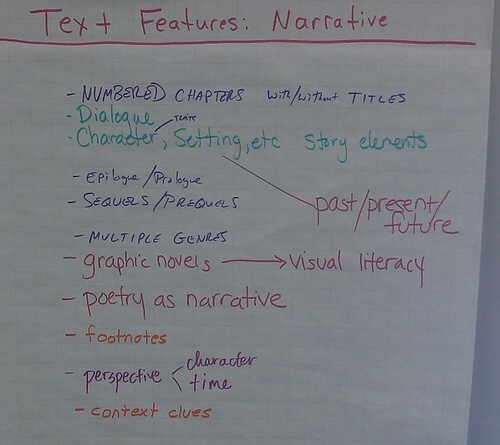 The opening activity of a workshop that I gave on the Common Core on Friday to my colleagues had us moving around the room, thinking and talking about the text features of narrative text versus information text, which I broke down further into the content areas of science, math and social studies. 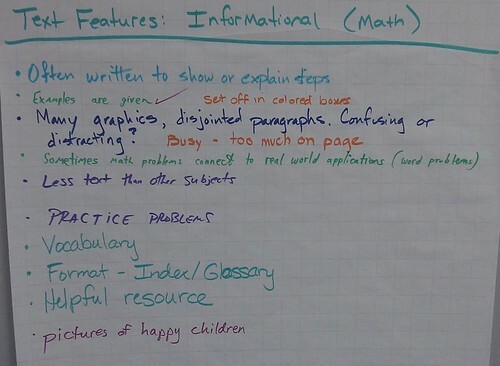 The carousel activity was designed to spark our thinking about content area reading, in particular, as that was the focus of a lot of our discussions that day.